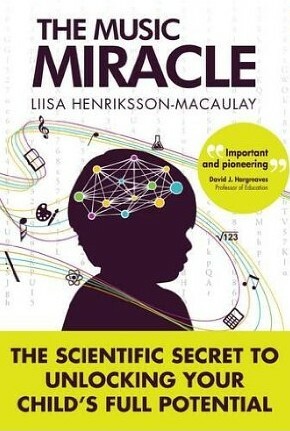 I recently heard about The Music Miracle, a new book by Liisa Henriksson-Macaulay all about the effect of music on children’s learning and how music training develops the brain. The Music Miracle is a really fascinating read. It is fully backed up by scientific studies, but is presented in an accessible way for parents to read. I probably wouldn’t have through the scientific studies myself so it’s great to have this information in a more accessible format. The book covers many aspects of how music training can impact positively on children, from boosting maths skills, to fitness, to speech and language skills, memory and brain power. It also dispels some of the commonly held myths, such as listening to Mozart to help raise your IQ. The studies referenced in this book show that it is not only classical music which has a beneficial effect, but any genre of music as listening to music is a manifestation of the happiness effect. As the book explains, the benefits of music are not just linked to listening to music or playing music games, although these would be good for a child too, but they are linked even more so to actual music training. Author Liisa Henriksson-Macaulay is from Finland, where most young children have the opportunity to study at the Musiikkileikkikoulu. There they are taught core music skills in a playful way. Liisa Henriksson-Macaulay has also created a music training package called Moosicology, which is inspired by her research and provides an easy and fun way for children to learn music skills such as rhythm, listening skills and musical reading. Find out more at the Moosicology website. I definitely found The Music Miracle a fascinating read. Although I knew that music is good for children generally, there is so much information in the book that I wasn’t aware of or hadn’t thought about, like the link between music and phonological awareness. You can find out more about The Music Miracle and Moosicology by watching this interview from BBC Breakfast with author Liisa Henriksson-Macaulay and Alex James, bass player of Blur and a key supporter of The Music Miracle. A bit of soft rock! My little one loves listening to music with lots of beat, he’s just started bopping along to everything! Jenny @ The Brick Castle recently posted…An actual romantic meal for two! Pop thankfully as I like that too! Pop and rock, although Liam is coming up for 13, so he may start looking at music we ‘re not so keen on! Just to be a rebel! Bon Jovi and Green Day at the moment – so rock tunes! He likes songs he has learnt from attending Bookbug at library. Whilst he also enjoys theme tunes :- Favourite being Thomas the Tank Engine and Friends. She loves going to rhyme time at the library, but I think she likes any kind of music because she starts dancing whenever she hears anything! Worryingly she likes rock music. The long-haired 80’s Whitesnake etc stuff. 🙂 She’s just turned 2. Bebop Jazz. I’m waiting for the day when she discovers the joys of my old punk rock records. Anything that involves an animal! Nursery rhymes and we also sing songs from the Musicals. Whatever is on the Just Dance videos on You Tube! My 9 month old daughter seems to love rock music! He likes guitar music, especially Daddy’s! anything as long as we are dancing to it! Rock music – and favourite is Crazy Nights by Kiss !! pop anything she can bop too! My little one is 20 months so it depends on the time of day. Generally anything we hum along to or dance to, classic to folk to rock. The wonder of the internet means you can introduce them to almost anything… though she tends to stick her fingers in her ears when she hears techno! My daughter loves nursery rhymes and sings row row over and over! My little boy loves classical music especially Peter and the Wolf. I think I’ll have to grab a copy of this book. Love finding out about this information. Thanks for linking it up to #musicexploration linky.